Unbelievable. It went down to the wire but London Saints again beat London Pompey at pool and darts – this time 8-7 – to set the scene for Sunday’s game…. 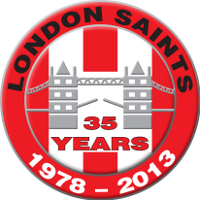 It’s back again – your chance to walk away with a stunning piece of London Saints silverware! London Saints join Plymouth, Chester, Bolton, Burnley and Blackpool in seeking promotion to Div 1. Fancy a game? London Saints Dart Team are constantly looking to improve – if you know the difference between the feathery bit and the pointy bit then you can help!